My dwarf hamster has a rather large bald spot above her left front leg. I noticed she has been scratching the area a lot more than usual and will scratch her right side as well although that side has no balding. The bald area is not quite red, but a pinkish hue. Her behavior has been normal. She has been eating, running on her wheel, and climbing. She has had the bald spot since Friday. She has had no changes to her diet and I clean out her cage every week. I also cleaned it out yesterday in case anything was causing irritation, however I do not use wood shavings only paper based bedding. I'm worried that she could have mites or it could be something worse. I also have a picture of the area I would be happy to e-mail you. I would love to see a picture! Can you email it to photos@askavetquestion.com? Picture has been sent. Thanks! Thanks for the picture of your cutie! There are only a few things that can cause bald spots in hamsters and also some itchiness. Unfortunately you are likely going to need a vet visit in order to get this cleared up. It certainly is possible that this is due to mites. Sometimes mites can come in on new bedding. I've seen hamsters with mites even though they have no contact with other hamsters. Another possibility is a parasite called demodex. Both mites and demodex are treatable with medication from the vet - either ivermectin or possibly an adaptation of a dog/cat flea medicine. 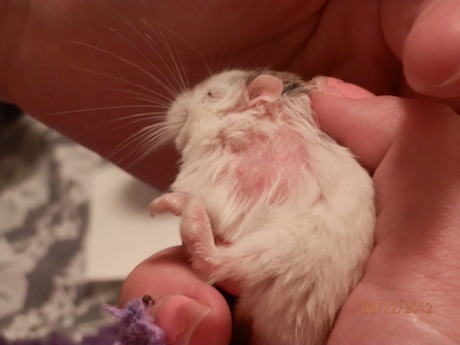 Some hamsters can get ringworm which can cause these symptoms. Ringworm is a fungal infection. In my experience this is not as common as mites or demodex. Ringworm is treatable with antifungal medicine from the vet. There are some unusual conditions that can cause hair loss such as lymphoma (a type of cancer) and cushing's disease, but these are unlikely. If your hamster wasn't itchy I would wonder if she had simply caught herself on something and pulled some fur out, but she shouldn't be itchy. If this seems to be getting worse rather than better then you'll need to seek out a vet for her. I wish I could give you an at home cure, but there isn't likely to be one. Thank you for all your help! I'm making a vet appointment for her tomorrow. I want to make sure she gets better soon!